The Swiss embassy in New Delhi has expressed satisfaction with the performance of the solar thermal cooling system started up at the complex in early 2017. It was designed and installed by the German-Indian joint venture VSM Solar following an international invitation to tender. It includes 630 m² of vacuum tube collectors with CPCs, also known as compound parabolic concentrators, and supplies energy to an absorption chiller with 60 tons of refrigeration (210 kW), made by Chinese-based Broad. It has been Switzerland’s first solar thermal cooling system at a government building outside the country, which owns roughly 300 of them around the world. “We are satisfied with the performance of the solar cooling system. Our Swiss embassy complex in New Delhi is now using 40 % less electricity,” confirmed Jodok Brunner, who heads Switzerland’s Berne-based agency in charge of the property the government owns abroad. “What we underestimated was the level of support required to operate and maintain the system.” His agency has signed a maintenance contract with VSM to ensure two engineers are present at all times to provide technical support. These engineers also spend several hours every week on cleaning the vacuum tube collectors, as New Delhi is one of the world’s most polluted cities, where dust is filling the air. The air conditioning inside the building needs to be operated manually too at times. “Together with the solar cooling specialists, we are trying to further automate the AC units,” said Brunner. 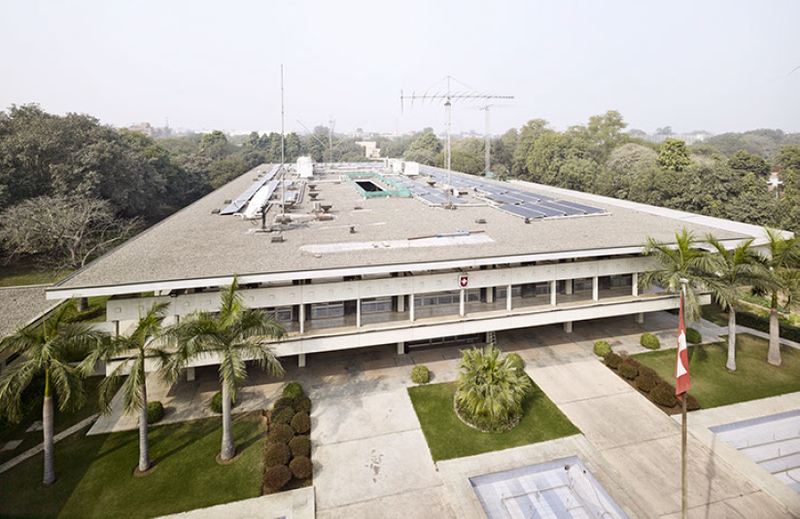 The vacuum tube collector system installed atop the main building of the Swiss embassy in New Delhi is primarily used for cooling. The solar thermal cooling system provides air conditioning in the main building and the visa application centre for 10 months a year and space heating for two, since the winter season is short. The investment came to Indian Rupee 62 million (EUR 0.78 million), of which INR 28 million (EUR 0.35 million) was spent on the solar thermal installation. The rest of the money was used to install a backup unit with electricity-driven compression chillers. In all, the vacuum tube collectors have 630 m² of aperture area. They provide water at 90 °C to a vapour absorption machine, which, in turn, produces water at between 7 °C and 10 °C to cool the buildings via a secondary circuit consisting of air handling units and fan coils. In winter, hot water provided by the solar thermal installation is directed to a heat exchanger and, when reaching a temperature of about 40 °C, to space heating units. Buffer tanks help store solar hot water to allow for the faster start-up of the system in the early morning hours. Two compression chillers have been installed too, with one backing up space cooling and the other supporting space heating. Switzerland uses about 600 buildings in 170 locations all around the world, of which 300 are rented. Brunner said that his agency was intent on lowering the carbon footprint of its building stock. It had been running about 40 solar hot water and solar PV systems at the time, while 10 new ones were being added each year. This text was written by Jaideep Malaviya, an expert in solar thermal based in India (malaviya@solrico.com).